It’s the year 2050 and your mid-life crisis has brought you back to dear old Dartmouth, as you always knew it would. You may not remember all the words to the alma mater, but you’re ready to skate on Occom Pond, build a snowman and tear up the slopes with your bionic post-knee-replacement legs. “Oh the places I’ll go, like the BEMA and King Arthur Flower!” you tell yourself as you attempt to zip up your old parka and eventually decide the zipper is just broken. The Dartmouth Coach, which is now a high tech hovercraft that travels from Boston Logan to Hanover in three minutes, pulls up to the Hop. 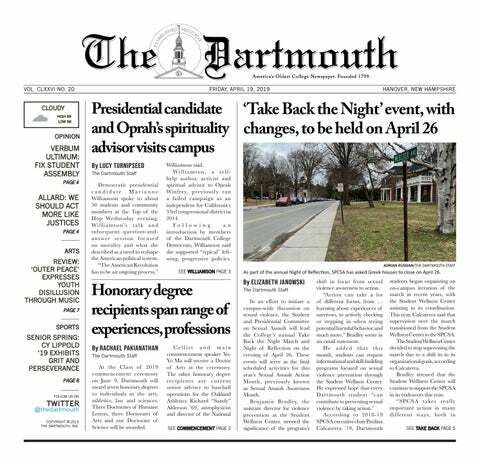 As you look out the window you encounter the first sign of change at Dartmouth — bare stomachs. Nay, bare stomachs in January. The class sweaters you and your classmates adored so much have been replaced with class tube tops. Your green 2015 sweater looks ridiculous compared to the miniscule, clingy swag of the class of 2050. Not a hoodie is to be seen among the sea of pinnies, coconut bras and Hawaiian shirts. “How on earth are they warm enough?” you wonder, until you happen to notice the next strange thing. In place of a giant snow sculpture, pine tree or multiple feet of snow, the Green is covered in sand and water — not to mention the bathing suits. Such numbers of bathing suits you’ve never seen. Say it ain’t so! The realization that the Green has been turned into a beach finally hits you when you see President Hanlon, now 95, sitting atop what was once AXA’s lifeguard stand, actually lifeguarding. You hope this is all just a bad dream, a byproduct of your cholesterol medication, but you are proven very, very wrong when you step off the bus and into the 95-degree heat. The still north and the hill winds cannot save you now. You are sweating like a hipster at a music festival, and are soon forced to rip off your ill-fitting winter garments until you are down to your miniscule Trips t-shirt and a pair of jeans which you have, in the literal heat of the moment, cut off at the knees. You swore you’d never succumb to the jorts fad that was so popular in middle school, but nevertheless, here you are, baring your veiny calves to the world. Students stare you down and whisper insults in slang you do not recognize. In composing my narrative of Hanover’s future I decided it might be wise to actually consult an expert about what that future will plausibly look like. According to geography professor Jonathan Winters, who has done extensive research into regional climate change in the next century, my tale is far from accurate. Winters noted that Hanover is likely to experience a 7 percent increase in precipitation by 2050. Yes, that means you should prepare for more rain. “Hanover gets about three feet of precipitation a year so about three extra inches of precipitation a year. For snow, ball-parking it, you’d get approximately 75 percent of what you used to get,” said Winters. While Hanover will not become a beach by 2050, according to Winter’s research the temperature rise in Burlington, comparable to Hanover’s climate, will result in 20 more days a year above 90 degrees. “By 2050 the climate in New Hampshire will be around the climate of Pennsylvania or Maryland,” said Winters. In case you thought you were off the hook, Winters made it clear that this change is absolutely due to human activity. You listen with rapt attention as Groot takes you back in time to 2015. He reminds you of the time you slept in your buddy Oscar’s van with the engine on all night, the evenings you cranked up your heat to the maximum setting and left your window open and the gasoline you used to burn down that abandoned warehouse. You are still mumbling this phrase when your eyes snap open. You use your fully functioning knees to spring up, open the blinds and gaze upon the feet and feet of beautiful white snow. “What year is it?” you ask your groggy roommate. From that day forth it was said of you that you kept the environment close to your heart all the days of the year. And so, as you would later observe in an EARS 06 paper — Mother Earth bless us, every one.